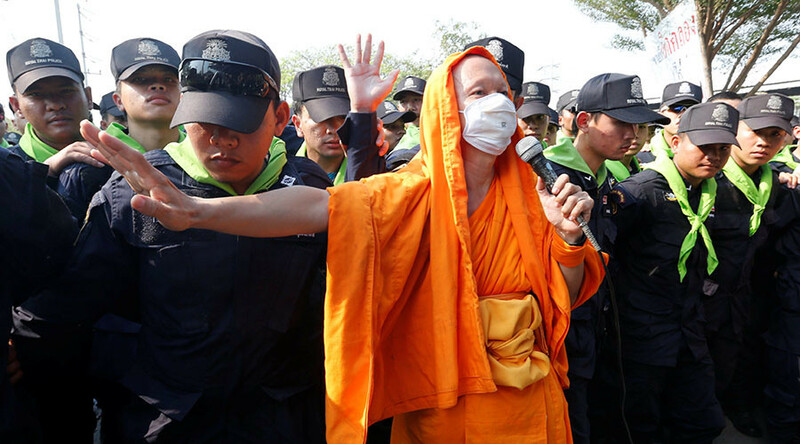 Hundreds of Buddhist monks and devotees clashed with police outside Bangkok’s Buddhist Dhammakaya Temple as authorities tried to find 72-year-old former abbot, Prha Dhammajayo, who is wanted for money laundering. The scuffle occurred on Monday when about 20 monks walked to the temple entrance which was blocked by police. The Bangkok Post reports three monks, two police and an elderly woman were slightly injured, with Reuters reporting there were no serious injuries. Dhammajayo faces charges of conspiracy to launder money and unlawfully taking over land to build meditation centers, charges which his supporters say are politically motivated. "They are a clear attack on religious freedom, putting Buddhist monks and laypeople at risk of arbitrary arrest and other punishments simply for the peaceful practice of their beliefs," the temple wrote in a letter to the country’s National Human Rights Commission, according to Reuters. "We are going to do all we can to avoid physical and violent confrontations. The searches will continue and we will ask for cooperation from the temple," Suriya Singhakamol of the Department of Special Investigations said. The standoff has been going on for days, and as the monks and their devotees rally around the temple, it has presented one the largest challenges to Thailand’s junta government since it came to power in 2014. On Thursday, Prime Minister Prayuth Chan-ocha ordered military powers to be used in the search for the abbot, using a security measure critics dubbed “the dictator’s law.” Police searched areas of the sprawling temple compound for the Dhammajayo but have so far failed to find him. On Sunday, the Department of Special Investigation (DSI) called on those who were not residents of the temple to leave by 3pm. Police have threatened to arrest temple devotees who have refused to leave the area. The Dhammakaya temple has been a site of controversy due to the belief that it is linked to the populist government of Thaksin Shinawatra, who was ousted by the army in 2006. The current junta carried out a coup in 2014. The government has so far avoided dealing too harshly with the temple, which boasts millions of followers in the country, which is 95 percent Buddhist.